Austin singer/songwriter blazes a trail through the North Country. James McMurtry wields words like a double-edge straight razor. He’ll take it right to the jugular if you’re on the wrong side of him--cut you once and you’ll bleed twice. Hunter S. Thompson with a guitar. Ask George W. Bush, who’s been in fellow Texan McMurtry’s sights more than once. Governor George W. Bush was the unnamed subject of another haunting McMurtry song of political intrigue on the same record. On the lake last night? Does the Governor know who killed the fishermen? Although he says “The Governor” is a fictional song, “There was a similar event to that happened when Bush was governor of Texas." The perpetrator was never found. McMurtry began stirring the political pot a few years earlier. In 2004, he wrote a song called “We Can’t Make It Here,” an anthem about the loss of jobs, social injustice and corporate greed. “I got a lot of real angry reaction. This was in 2004, when Bush’s numbers were really soaring. But it’s not specifically anti-Bush,” he says. The song was a lot more popular on the East Coast and in the Northeast. “Union states where they’ve lost a lot of jobs to outsourcing,” says McMurtry. “The song showed me the power of the internet,” he adds. He put it online as a free download during the 2004 election and it surpassed any CD he had ever sold. Author and McMurtry fan Stephen King said it “may be the best American protest song since (Bob Dylan's) 'Masters of War.’” A lot of other folks agreed. It helped catapult Childish Things to the top of the Americana charts for six weeks and launched McMurtry’s somewhat reluctant role as a folk hero among the pissed off and politically disenfranchised. Somehow, I think he’ll find enough material. It would be selling James McMurtry short to pigeonhole him as a political protest singer. But then, that rap never seemed to hurt Dylan’s career. Besides political and corporate scoundrels, McMurtry’s lyrical landscapes are littered with grandmas and ghosts, lost loves and lowlifes, spun out in a bourbon-smooth voice that’s as comfortable as old leather. He’s a blistering guitar player to boot, and can lock into a blue highway groove like J.J. Cale’s at the wheel. Go see for yourself. America may not make a lot of things here any more, but we’ll always make great music. And this is some of it. 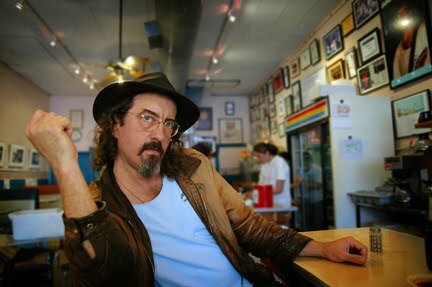 James McMurtry is appearing at Pizza Luce in Duluth Thursday, March 31, and Friday, April 1, at the 400 Bar in Minneapolis. He’s co-headlining with the Bottle Rockets, who open both shows. Photo courtesy of Cary Baker's conqueroo. U.S. Coast Guard could change lift bridge frequency. All MnDOT has to do is ask them. If there’s one thing upon which all sides on the Stillwater bridge controversy agree, it’s that raising the historic lift bridge is the primary cause of traffic tie-ups in downtown Stillwater. Yet everyone has been so focused on doing an end-run of the Wild & Scenic Rivers Act with a four-lane freeway bridge across the river that the simplest of solutions—reducing the absurd frequency of the lifts on the Stillwater bridge—has not even been considered in at least a decade. The current schedule calls for lifts every hour or half-hour from May 15-October 15, with less-frequent lifts between 2:30 p.m. and 5:30 p.m. on weekdays and late at night. Minnesota Department of Transportation (MnDOT) spokesperson Beth Petrowske couldn’t say for sure when the lift bridge schedule was last looked at either. Spokespersons for environmental groups who have been heavily involved in the Stillwater bridge issue over the years could not ever recall public hearings being held about changing the lift bridge schedule—despite its role as a primary traffic snafu. Even spokespersons for the U.S. Coast Guard, which has jurisdiction over the St. Croix River from Prescott to Taylor’s Falls as a navigable waterway, cannot recall when the subject was last revisited. “Not anytime in the last few years,” says Eric Washburn, administrator of the U.S. Coast Guard Eighth District Western Rivers Bridge Branch in St. Louis. His office oversees more than 1,800 bridges in 22 states, including the Stillwater lift bridge. The Coast Guard would issue a 60-day “Notice of Proposed Rulemaking” during which time comments could be submitted and a public hearing scheduled in Stillwater to take testimony. Washburn says lift- and draw-bridge regulations are “all over the place” depending on their location. In Joliet, IL, for example, five drawbridges in a row on a heavily traveled highway are prohibited from opening during high-traffic periods. Elsewhere, on rivers with little boat traffic, bridges are required to open on demand only with 24 hours notice. In Arkansas, Washburn says, one bridge was recently converted from scheduled lifts to remote operation as needed. 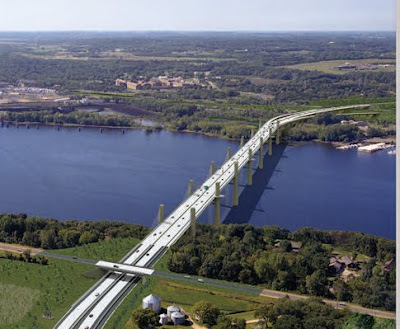 MnDOT’s own 2004 Draft Supplemental Environmental Impact Statement (EIS) on the St. Croix River Crossing Project cites the bridge lifting as a major factor in traffic problems in Stillwater. While this relatively painless solution to reducing Stillwater’s traffic problems continues to be ignored, Gov. Mark Dayton and U.S. Sen. Amy Klobuchar have joined Rep. Michele Bachmann in seeking to exempt the proposed four-lane freeway bridge over the St. Croix from the National Wild & Scenic Rivers Act. Their actions have infuriated former Vice President Walter Mondale, who as a U.S. senator from Minnesota co-authored the National Wild & Scenic Rivers Act in 1968. Klobuchar has followed Bachmann’s footsteps in disingenuously describing her attempt to exempt the bridge from the Wild & Scenic Rivers Act. What Klobuchar didn’t tell MPR is that only two exemptions have ever been granted for projects on rivers protected by the Act, and neither of them were related to transportation. Both were for fisheries habitat improvement projects that improved the ecology of the rivers and were miniscule in scale compared with the $700 million freeway span Klobuchar is pushing. Klobuchar attempts to justify adding a four-lane, 65-mph freeway bridge across a federally protected river because other eyesores already exist on the St. Croix, such as the Xcel Energy coal-fired power plant south of Stillwater. “When you look at that, you realize that this isn't exactly a residential area or a scenic moment,” Klobuchar told MPR. Evidently, no one told Klobuchar about the 60 Oak Park Heights homes that already were bought out and destroyed in the 1990s to make room for her and Bachmann’s bridge. Klobuchar also ignores Mondale’s concern that allowing such a bridge to be exempted from the Act on the St. Croix would set a “dangerous precedent” for similar exemptions on other protected rivers. If the U.S. Coast Guard is ready and willing to hold public hearings on changing the lift bridge schedule—a move that could have immediate impact on Stillwater’s traffic problems—why hasn’t MnDOT asked them to do that? No one seems to know. Stillwater Mayor Harycki sounded surprised that it was only a matter of asking the Coast Guard to change the regulation and they would take the matter up. He agreed that it would be worth trying and that MnDOT, as the owner of the bridge, would be the appropriate authority to make that request. With the imprimatur of the river’s boating interests—recreational and commercial—the Coast Guard’s Washburn says they would “strongly consider” changes to the lift bridge schedule to alleviate land transportation congestion. Isn’t that something everyone can agree on for the time being so that “all possibilities” can be “reopened for consideration” as Dayton promised in February before he did an inexplicable about-face three weeks later and announced his support for the Bachmann Boondoggle? It’s your move, MnDOT. What are you waiting for? 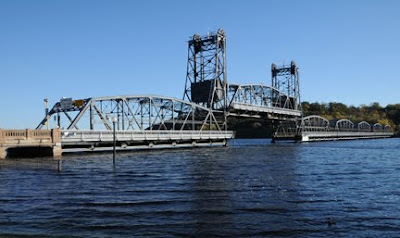 Top photo: Stillwater Lift Bridge in the raised position. Bottom photo: Gov. 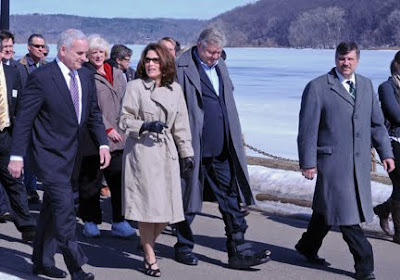 Mark Dayton walks in lockstep with Congresswoman Michele Bachmann, her political strategist and husband Marcus Bachmann, and Stillwater Mayor Ken Harycki as they toured the Stillwater bridge in March. 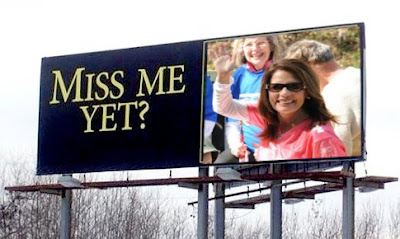 Congresswoman Michele Bachmann is scheduled to breeze through the district she purportedly represents on Friday, March 18, to pimp for the billion-dollar Bachmann Boondoggle freeway bridge across the St. Croix River. Bachmann will be meeting with Gov. Mark Dayton and Stillwater Mayor Ken Harycki in downtown Stillwater at 12:15 p.m. for a 45-minute tour of the historic lift bridge that crosses the river at Chestnut Street. Bachmann and her cohorts have been spreading misinformation about the proposed four-lane, 65-mph bridge, and often can't even get their stories straight. But that may be catching up with them. Bachmann has accused "radical environmental groups" of distorting what her legislation to circumvent the Wild and Scenic Rivers Act, the courts and the National Park Service would do. She insists that it doesn't exempt the new bridge from the Act at all. But Harycki, the bridge's biggest local cheerleader, on March 14 argued that nothing can be done about building a bridge without an exemption from the Wild and Scenic Rivers Act. He also claimed that traffic on the I-94 bridge would be "gridlocked to St. Paul" without a new bridge at Stillwater. However, Harycki's hyperbole failed to convince the Stillwater City Council to pass a resolution supporting Bachmann's legislation. It was tabled until the next meeting. Bachmann fear-mongers about 'radical environmentalists' while pro-development bridge coalition cites phony precedents. A river of misinformation and smears is flowing from Congresswoman Michele Bachmann and other proponents of a massive new freeway bridge over the federally protected St. Croix River at Stillwater. Bachmann charges that opposition to the new bridge is coming from “radical environmental groups.” She took time out from the Tea Party rubber-chicken circuit last month to breeze by the capitol and drop a bill in the hopper to exempt the St. Croix River from the National Wild and Scenic Rivers Act. Meanwhile, the fledgling Coalition for St. Croix River Crossing, a pro-bridge consortium of St. Croix Valley government and business groups on both sides of the river, is touting two previous projects exempted from the Wild and Scenic Rivers Act as being comparable to the proposed Stillwater bridge when, in fact, the exemptions weren’t even for bridges. They were for projects designed to preserve the fisheries of two protected rivers and had absolutely nothing to do with transportation. But that hasn’t stopped the coalition from perpetuating this myth through the media, presenting it as precedent for exempting the Bachmann Boondoggle from the Act. Alarmed that “radical environmental groups” were in our midst, I decided to contact one of them: the National Parks Conservation Association (NPCA). The NPCA was established in 1919—three years after the National Park Service came into being—to serve as an advocate for the protection of America’s national parks. The NPCA Midwest Office oversees 48 National Park sites in 11 states, including the 93,000-acre St. Croix National Scenic Riverway. Just how radical are they? Dayton responded that “all possibilities have been reopened for consideration” with regard to bridge options. The St. Croix River long has been considered one of the more unique rivers in the Wild and Scenic Rivers system because of its close proximity to a major metropolitan area. The Wild and Scenic Rivers system, created in 1968, protects more than 11,000 miles of 166 rivers in 38 states and Puerto Rico—barely more than one-quarter of 1 percent of the nation's rivers. The Upper St. Croix, from its source to Taylor’s Falls, was among the first rivers designated under the Act; the Lower St. Croix, from Taylor’s Falls to Prescott, WI, was added to the system in 1972. “You don’t grant exemptions to the Act lightly,” McClure stresses. Which brings us to the exemptions hailed by the Coalition for St. Croix River Crossing as precedents for granting an exemption to the Act for the proposed four-lane, 65-mph freeway bridge at Stillwater. William Rubin is executive director of the St. Croix Economic Development Corporation (EDC) in Hudson and a member of the Coalition for St. Croix River Crossing. The Coalition was incorporated in Minnesota in December 2010 and lists the Stillwater City Hall as its address. The St. Croix EDC website features a news release detailing the pro-bridge coalition’s goals and notes that two previous exemptions have been granted from the Wild and Scenic Rivers Act. Other news reports about the Coalition state that the two exempted projects were “similar” to the proposed Stillwater bridge, or that they actually were for bridges. When I asked Rubin for specifics about the previous two exemptions from the Wild and Scenic Rivers Act that his group cited, he didn’t have a clue as to what they were. “Maybe you should ask the Department of Transportation,” he replied. When reminded that the reference to the exemptions was information put out by his group, and not the Department of Transportation, Rubin became irritated. “We deal in economic development here. Maybe our journalistic skills aren’t all that they should be,” Rubin says. There’s a good reason why Rubin wouldn’t want to talk about the exemptions: because they don’t even remotely resemble the proposed Stillwater bridge project, and couldn’t under any reasonable circumstances be compared to it. According to Dan Haas, U.S. Fish & Wildlife planner who sits on the federal Interagency Wild and Scenic River Coordinating Council, “There have been only two exemptions to the Wild and Scenic Rivers Act after the fact.” Neither of them were bridges, nor were they even transportation-related. One exemption was for a sea lamprey barrier on the Pere Marquette River in Michigan. This electric fish barrier features bottom-mounted electrodes on a wooden deck. 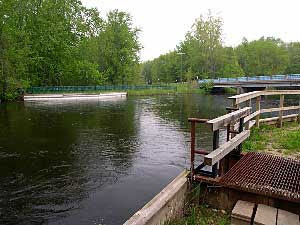 It works in conjunction with a fish bypass channel and lamprey trap to block upstream migration of Atlantic sea lamprey into trout spawning habitat on the river. The lamprey are diverted, trapped and electrocuted, eliminating the need for chemicals to rid the river of them. 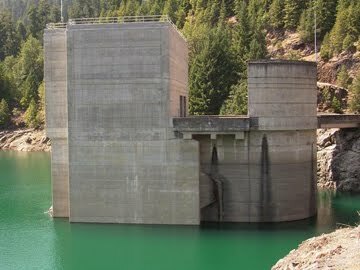 The other exemption was for a temperature control tower built upstream from Cougar Dam on the South Fork of the McKenzie River in Oregon. The tower takes in warmer waters from the surface of Cougar Reservoir above the dam to maintain consistent temperatures downstream from the dam. This allowed for the return and revitalization of Chinook salmon populations on the South Fork of the McKenzie, which had stopped migrating up the river due to cold waters flowing out from the bottom of the reservoir following construction of the dam in 1963. The reservoir was drained for the tower’s construction but once it was refilled, the tower was submerged. The only bridges that have been built over designated Wild and Scenic Rivers have been built in the same corridor as the old bridge, and then the old bridge was torn down upon completion of the new one. Rubin and the Coalition for St. Croix River Crossing aren’t the only bridge proponents misrepresenting the facts. Not surprisingly, Bachmann is playing fast and loose with them as well. Besides painting opponents of her billion-dollar boondoggle as “radical environmentalists,” Bachmann also claims her critics are lying about what her bill would do. While Bachmann would prefer that the history of the National Park Service and the Stillwater bridge began in 2005, the fact is, the NPS opposed the bridge in 1996 before it supported it in 2005. It’s no coincidence that the NPS reversed itself during the Bush Administration, yet Bachmann was silent on that flip-flop. In a lawsuit filed by the Sierra Club, U.S. District Judge Michael Davis ruled in March 2010 that the NPS 2005 policy reversal ignored its 1996 decision against a similar bridge and must be revisited. Upon review of the 2005 decision, the NPS announced last fall that it had determined that the bridge as proposed could not be built without causing “direct and adverse effects that cannot be avoided or eliminated,” a violation of Section 7(a) of the Wild and Scenic Rivers Act. So Bachmann not only is seeking to exempt the bridge from the Wild and Scenic Rivers Act by declaring its most recent application null and void, she apparently is trying to exempt the project from judicial review as well. Bachmann’s legislative end-run on the courts, the NPS and the Wild and Scenic Rivers Act is only the latest salvo in this long-running battle to preserve the St. Croix River and the integrity of the Act itself. Bachmann introduced essentially the same bill last year and attracted no co-sponsors. This year, Wisconsin Republican Sean Duffy and Wisconsin Democrat Ron Kind have signed on. Bridge opponents can take heart in the fact that despite her high visibility as self-appointed Congressional leader of the Tea Party caucus, the ineffective Bachmann has not passed one piece of legislation in her entire congressional career; her tenure in the Minnesota State Senate was equally nonproductive. There’s also the niggling little detail of the bridge’s $700 million-and-climbing price tag, which flies in the face of Bachmann’s alleged fiscal conservatism. The federal government is hardly flush with cash these days, and neither Minnesota nor Wisconsin has a few hundred million lying around for anything, let alone a bridge whose need is dubious. “A federal spending surge of more than $20 billion for roads and bridges in President Obama's first stimulus has had NO EFFECT on local unemployment rates, raising questions about his argument for billions more to address an ‘urgent need to accelerate job growth,’" Bachmann wrote. If the latest pronouncements from disingenuous pro-bridge forces are any indication, the arguments for building the Bachmann Boondoggle are likely to get even more specious. "I don't see Michele and that group backing down," says the NPCA’s McClure. But she remains optimistic given the latest turn of events. “I think it would behoove everyone to take a step back and look at the transportation issues,” says McClure. She points to alternatives like the replacement bridges that were built over other Wild and Scenic Rivers—called “low and slow” bridges because they cross at river level rather than bluff level, and are built for slower traffic speeds to minimize their impact on the river. “I do think there’s a solution out there,” she concludes. TOP PHOTO: Visualization of proposed four-lane freeway bridge over the St. Croix River as seen from a Wisconsin aerial view. Image by Minnesota DOT. MIDDLE PHOTO: Sea lamprey barrier on the Wild & Scenic Pere Marquette River in Michigan. BOTTOM PHOTO: Cougar Dam Temperature Control Tower on Cougar Reservoir on the Wild & Scenic South Fork of the McKenzie River in Oregon.